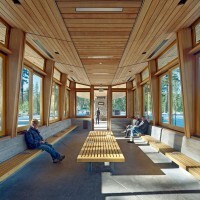 WRNS Studio designed a transit center for Tahoe City in California. At the turn of the last century, Lake Tahoe became a scenic holiday destination. The region has since become a year-round residential community as well as a popular recreational retreat for the roughly 11.5 million people living within a four-hour driving distance. As a result, traffic congestion, inadequate parking, and pollution have begun to threaten Tahoe’s natural resources. 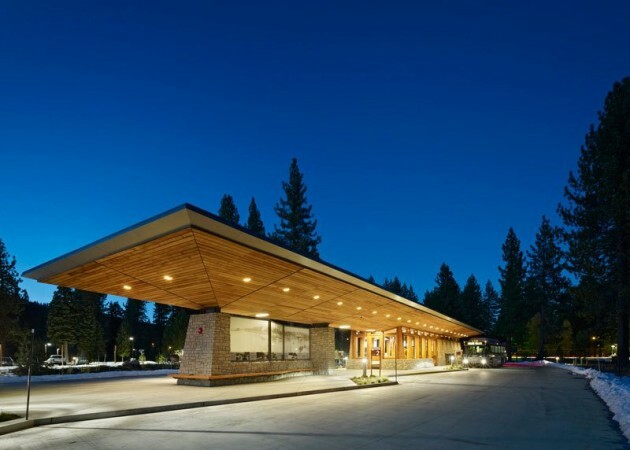 To encourage greater reliance on public transportation, the Placer County Department of Public Works commissioned WRNS Studio to design an intermodal transit center in Tahoe City, California. 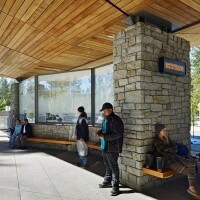 The Tahoe City Transit Center incorporates surface parking for 130 cars, a bus loop for six regional buses, and a transit facility with two restrooms, administrative space, built-in bike lockers, and an enclosed meeting area for up to 40 people. 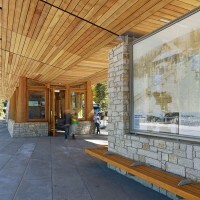 Configuring the facility as a bus loop, with buses loading and unloading on both sides, minimized the facility’s footprint as much as possible. 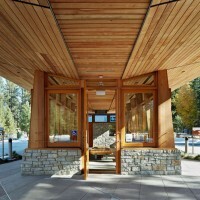 Shaped like a boat, with long wooden slats along the underside, the roof is supported by a few stone columns to allow views of the landscape to pass underneath. The roof is designed to hold snow up to 250 pounds a foot. 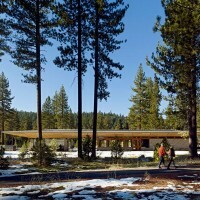 A snow melt system around the edge of the roof gradually melts the snow, and a rainwater harvesting system collects the water in gutters, stores it in a 4,000-gallon cistern, and reuses it for irrigation and toilet flushing. The site layout incorporates existing trees and established walking and cycling paths. 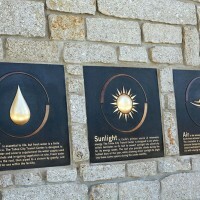 Sustainable landscape strategies include pervious pavement in the parking areas, use of local materials, and low-water native planting and vegetation. 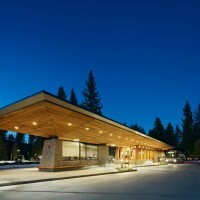 Although modern in form, the building references its context by bringing together two of the areas predominant materials, Sierra granite and western red cedar. The building conserves energy in a number of ways. 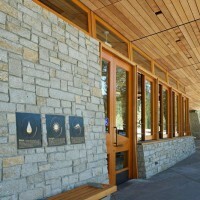 Laminated solar cells are integrated into the roof, supplying most of the facility’s peak load. Operable windows and a clerestory facilitate natural ventilation. The broad roof eaves provide shade in the warm months; in the cold months, the angle of the roof allows direct sunlight, filtered by the trees, to illuminate the narrow floor plate. Thermally massive walls, high-performance insulated glazing, and radiant heating further reduce energy consumption. 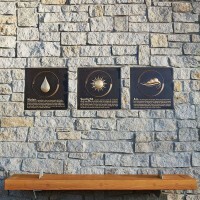 A series of bronze plaques embedded in the granite walls explains the transit center’s sustainable elements, helping visitors to understand their connection to the natural environment.